From the moon's formation, to its potential for future exploration, this richly illustrated volume presents 100 milestones in lunar history. With dazzling images on every spread, and illuminating text by astrobiologist Dr. David Warmflash, Moon: An Illustrated History chronologically presents 100 milestones in the Moon's development and exploration. 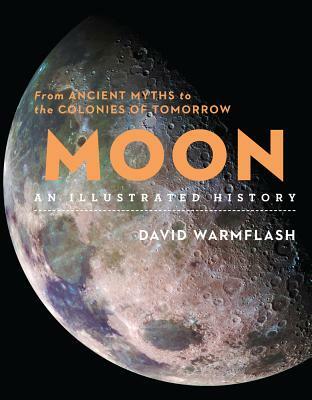 Starting 4.5 billion years ago when the Moon formed, this stunning volume moves from the hypotheses of the Moon's formation (4.5 billion years ago) to sixth-century BCE predictions of solar eclipses, from the twentieth-century Space Race between the US and the Soviet Union to private space companies and possible future lunar colonies. Find out about lunar calendar systems and cults in the Bible; how lunar brightness was used to estimate stellar distances; how advancing telescopes in the seventeenth century allowed us to eye the Moon more closely; how author Jules Verne inspired the Father of Astronautics; the originals of the Saturn V Moon Rocket; the Apollo missions, and so much more. Dr. David Warmflash is an astrobiologist and prolific science writer. He was in the first cohort of NASA astrobiology postdoctoral trainees and served as a member of NASA's Jupiter Icy Moons Orbiter Science Definition Team. He has collaborated with The Planetary Society on three experiments that have flown in space, including "the peace experiment" that involved an Israeli and a Palestinian student working with Dr. Warmflash as co-investigators. He has published in scientific journals and popular science publications including Wired UK, Scientific American, Discover, Air and Space, Astronomy Magazine, and others. He contributed to the book George and the Blue Moon by Lucy Hawking and Stephen Hawking, and was interviewed for an article in the Kansas City Star concerning the accuracy of the science in the sci-fi TV series Orphan Black.